Home / Shipping News / Dry Bulk Market / Dry Bulk: Seasonality or Something Deeper Behind the Dry Bulk Market’s Downfall? 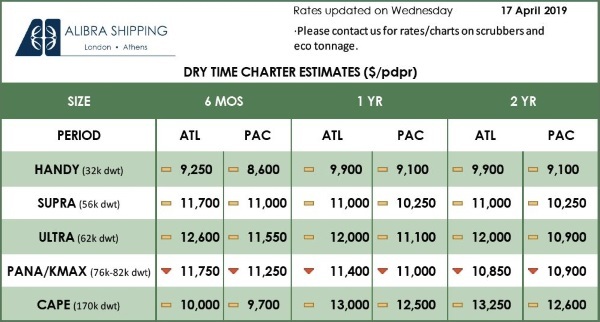 Dry Bulk: Seasonality or Something Deeper Behind the Dry Bulk Market’s Downfall? 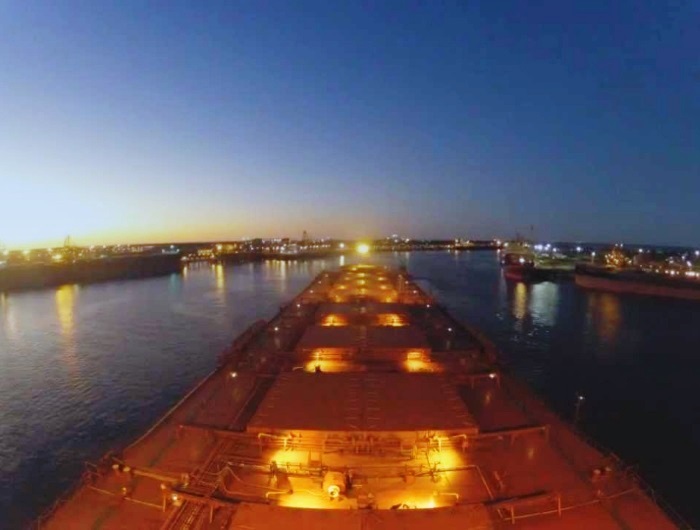 The dry bulk market entered 2019 in a dire state, out of which it seems unable to recover. 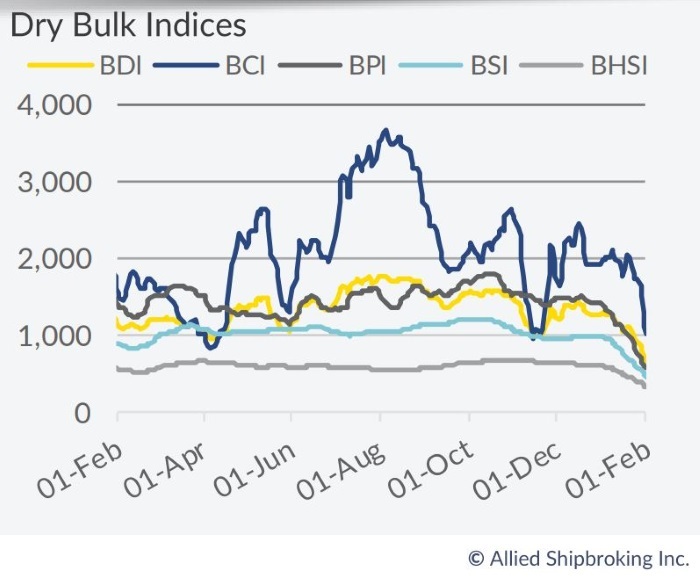 In its latest weekly report, shipbroker Allied Shipbroking said that “the dry bulk sector is in the doldrums, with most market participants seemingly left utterly perplexed, and simultaneously, in pursuit of any positive signs to be had. All this seems to have its roots partly in the correction noted back in November of 2018, while the actual damage was not so much that made to realized earnings but rather the steep shift of sentiment towards doubt and skepticism in respect to the whole recovery story we have been seeing since 2016”. According to Thomas Chasapis Research Analyst with Allied, “in terms of numbers, the BDI has eased back to 645bp (while just 10 days back was above the 1,000bp mark), its lowest level since August 2016. This steep correction is in line with that of the Capesize segment, which witnessed a 49.9% decrease the past 10 days, while the free fall in the overall market had already begun from the very start of the year, with the Panamax and Supramax segments having lost 60% and 49% since early January. Even if we take under consideration the Chinese New Year lull, the accident at the Vale dam and the puzzling Chinese – US trade relations, it seems as though the problems being faced now by the market are deeper rooted and require a more wholistic view to be taken”. Chasapis noted that “the paper market could be of help in capturing parts of the underlining sentiment at play in the market. After a good rally and performance during the summer period, late August saw a peak in the levels noted in FFA contracts for both 4Q18 but also for forward quarters, such as 1Q19. 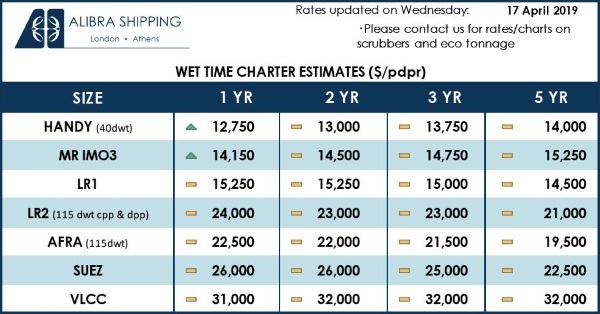 Indicatively, the Capesize TCA reached above US$ 15,000/day, while the Panamax TCA and Supramax TCA, were well above US$ 11,000/day and even reached levels close to US$ 12,000/day in the case of the Panamaxes. Looking at it in retrospect, the exaggeration is rather apparent. However, the interesting part comes later. In November the derivatives market was on a sharp downward correction, heavily influenced by the major drop in the Capesize freight market. At this point, we saw a hefty collapse in Capesize FFA rates, with contracts for the month of January being at levels of around US$ 11,500/day, far more bearish than the US$ 14,142/day the actual market witnessed in the end”. Allied’s analyst added that “at the same time the Panamax and Supramax sizes noted levels of between US$ 10,000 and US$ 11,000 per day in the FFA market, while the actual market figures closed in at US$ 8,342 and US$ 8,547 per day respectively. From this it is interesting to note how the paper market even at its most bearish proved to be overly optimistic rather than going with the theoretical approach whereby an actual market shock would reflect a bigger asymmetry in the paper market (as that note in the Capesize market). If the trends in paper market seem to be rather disconnected with what the actual market is doing, it’s even harder to put your finger on the recent share buy-back activity noted at the final part of last year”, he said. According to Chasapis, “given what we witnessed during January, this move seems somehow “expensive” now, especially in an industry that is struggling to be publicly funded. Either there was a touch of conviction as to the future market’s potential (despite the stringer availability of capital overall and the future need for sufficient cash flow so as to meet upcoming regulatory requirements), or it was merely a decision of buying below net asset value and boosting key financial ratios such as EPS. It is likely that the answer lies somewhere inbetween. All being said, there is still hope for a quick recovery at hand, but given the severe weakening in freight returns, maybe it is time to re-evaluate the levels at which the market will be finding a balance during the course of the year”, he concluded.